Is your dealership prepared to guide car shoppers online from preliminary research all the way through the funnel to buying their new wheels on your website? We were lucky enough to steal Mike Gignac (President & General Manager) away from Richmond Chrysler to sit down and chat with us. He answered a few of our burning questions about the automotive industry and gave us a glowing review too. If you’re interested in reading another informative post and watching more footage of our conversation with him, check out this blog. In this short video below, he discusses the changes he’s experienced in the automotive industry with the introduction of the internet. If this isn’t a reason to go digital, we don’t know what is! While online car buying seems like a feature in the distant future, we’re actually now seeing the full process of car buying – from preliminary research to purchase – come to fruition completely online in various countries around the world. Even though it may be just a small portion of the market for now, it’s well worth investing the time into learning how to future-proof your online presence to be prepared just in case this trend really takes off here in Canada. Why is buying a car entirely online attractive for car shoppers? A survey conducted by Edmunds.com reported that, out of 1002 people in the study, 83% of car shoppers would prefer to avoid the hassle of going through the traditional car-buying process of purchasing a car in a dealership. We now live in a busy time and there’s a constant demand for everything right now (or yesterday) and it seems that everyone is trying to save time anywhere they can, especially through buying products online. As Mike says in the video above “…people want the information that they want right away and accurate”. You can buy anything online at the quick click of a button – from a Nicholas Cage pillowcase to a tongue brush to groom your cat. More relevant to dealers, the Globe and Mail reported that 44% of car shoppers wish to purchase their next vehicle online. The internet revolutionized every industry and the automotive vertical is no exception. Not too long ago, the only way to buy a car was by walking in on foot, finding a car on the showroom floor, then filling out paperwork and negotiating the price with a car salesperson. It seems that, of the 3 hours spent at the dealership on average, half of that time is spent negotiating or filling out paperwork. Unfortunately, this process drives down customer satisfaction (according to a recent Autotrader study). Based on this, there is increasing demand from consumers to speed up the car buying journey and avoid the negotiating process as much as possible. We now see many dealerships offering as many services as they can online to help car shoppers cut down on dealership time. For example, as you saw our Hall Of Fame Unique Selling Propositions blog post a couple of weeks ago, a few dealership USP’s highlighted being able to take the test drive to the customer, helping them save travel time. Further, many dealerships (as Mike Gignac suggests in the video above) are able to do financing and offer the majority of the paperwork online to the point where the last piece of the puzzle is to get the car to the customer at their house. So perhaps buying a car completely online isn’t too far fetched. Will this movement phase out dealerships like Blockbuster? Now that we’ve ruffled a few feathers, we’re here to reassure you. The answer to this question is (most likely) no. As Mike mentions, car shoppers still like the personal touch of visiting a dealer, speaking to the experts and taking a test-drive at a physical location. As with buying anything online, it can be risky not knowing who you’re getting the product from or whether the business is legitimate or not. We suspect that the demand for visiting a physical location while making a large purchase will never really die out. We envision that dealerships will no longer simply be viewed as a place where one purchases a vehicle every 5-10 years, but where people build lifelong relationships to help solve their ever-evolving transportation needs. 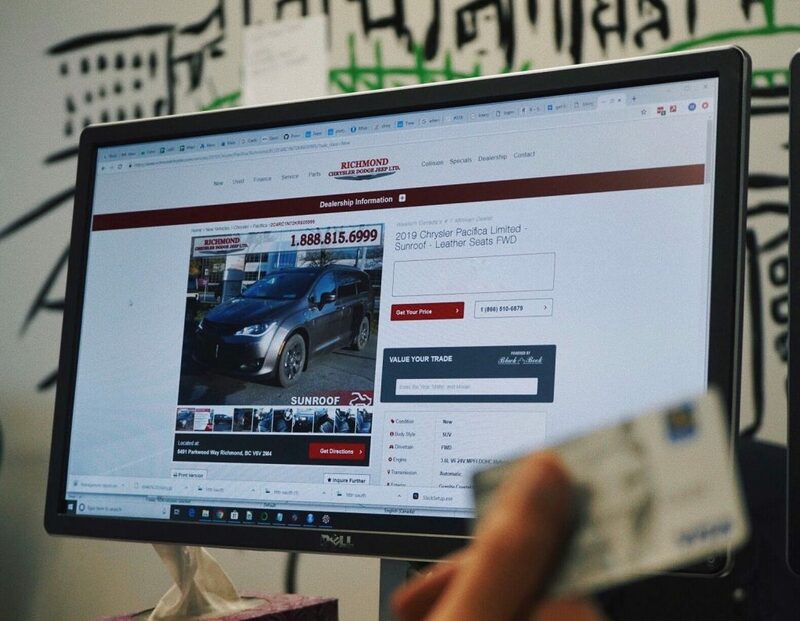 While the ability to completely purchase a car online may take time to root itself here in Canada, we are seeing dealers step up their digital game and offer more of their services online in preparation. If you’re curious about how we can help your dealership improve its digital presence to prepare for this shift, get in touch with our Customer Success gurus and let’s start the conversation!